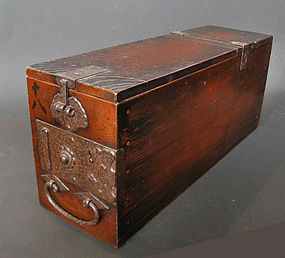 Stuishu, multi layer lacquer over wood, box, used to hold letters from the Showa Era, 1925-1989. The lid has a serene landscape with mountains. 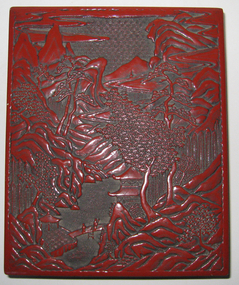 On the inside it has the artist's signature, Kinshodo, and the date, Showa 40 October 10. It is a presentation piece of congratulations from a company, Kabushiki Kaisha in Sendai. The box is bordered with flowers and a rectangular pattern. It measures 5" tall 10.75" wide 13" long. Overall excellent condition. 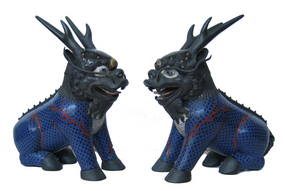 Beautiful pair of Chinese blue cloisonne mystical animals, possible Qilins, from the 19th century. The animals are beautifully rendered in bronze with whimsical cloisonne details. They measure 11 1/2" tall. Overall excellent condition. From the Collection of Joe and Selma Ferron. Published in the book "Cloisonne Extraordinaire" by W.F. Alexander and Donald K. Gerber, page 47. 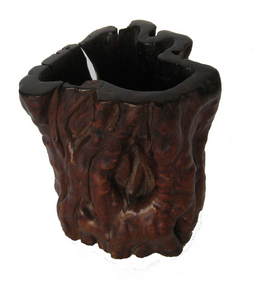 Eye catching 19th century root wood brush holder. The exterior is beautifully polished. Ching dynasty. 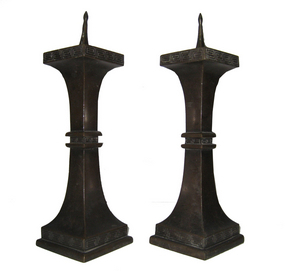 It measures 4.75" tall, 4" wide. Beautiful porcelain kutani beauty, geisha in training. She reads a poem, possibly a love poem. She wears a robe that is tied in front, miko, indicative that she is not yet a geisha. The outer robe is blue decorated with white, red, green, and gold colors. Overall excellent condition. She measures 13.5" tall. Meiji Period (c1900). 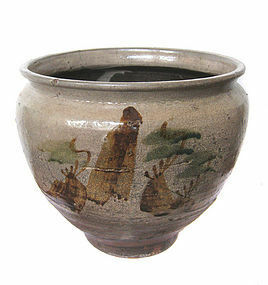 Beautiful antique bowl from the late Southern Song/ Yuan Dynasty, 12-14th century. 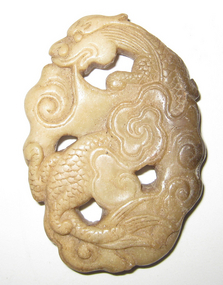 The bottom of the bowl is applied with two scaly fish. 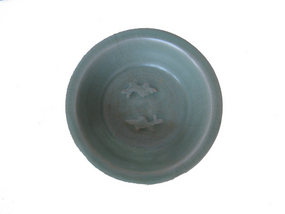 The bowl is covered overall with a sea green tone glaze that is paler on raised areas. It measures 1.75" high by 5.25" wide. 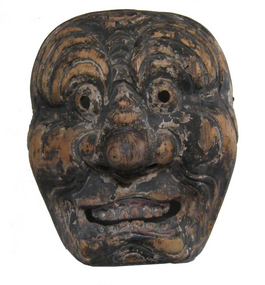 Antique Japanese 17century Gigaku mask from the early Edo period. Carved from wood and painted with black, red and other colors. Loses of pigment throughout. It would have been used a temple play.